Update: We've spent some time with the Amazon Echo Spot, and you can read our early impressions in our in-depth First Look. So far, the Spot appears to be a fun, versatile, video-capable addition to the Echo family. See Spot run! Sorry, not that kind of spot. Amazon has a new device, the Amazon Echo Spot, a tiny smart alarm clock/speaker with a screen. The Echo Spot was unveiled during a surprise press event in Seattle on September 27. Think of Spot as a cross between an Amazon Echo Dot and an Amazon Echo Show. The Dot because of Spot's compact size and audio capabilities, and the Show because of its display. Don't let size fool you, however. The Spot comes loaded with features while maintaining a form factor that easily fits on a bed-side table or space-deprived counter top. Spot is basically a really advanced, voice-controlled alarm clock that lets you watch videos and make calls. Here's everything you need to know about the Amazon Echo Spot, which will start arriving at customer doorsteps in December. When is it out? December 19 in the US, with pre-orders open on Amazon US now. It will arrive in the UK and Germany in 2018. The Amazon Echo Spot release date is December 19 in the US, according to the smart speaker's Amazon listing page. Customers in the US can place an Echo Spot pre-order on Amazon right now. As for other regions, the Echo Spot will be available in the UK and Germany sometime in 2018. There's no word on when it may arrive in Australia, but considering the original Echo isn't on sale in the country, it's doubtful Spot will arrive for some time. As for the price, the Amazon Echo Spot costs $129.99 in the US. That's about £100 / AU$165, though those aren't official prices for these regions. The Amazon Echo Spot is significantly more expensive than the Amazon Echo Dot, which costs $49 / £49 / about AU$109, but then again, it has a display. The Amazon Echo Spot may be small but it packs a decent amount of tech in its 4.1” x 3.8” x 3.6” (104mm x 97mm x 81mm) frame. These include a front-facing camera, a 1.4-inch built-in speaker, a 3.5mm stereo port, four microphones along the top, and various buttons to control the mics, camera and volume. The Spot display measures 2.5-inches across, and it's here you'll be able to watch video flash briefings, conduct video calls and see the feeds from smart cameras in your home. Like the Amazon Echo (2017) and Amazon Echo Plus, the Echo Spot features second-generation far-field voice recognition, allowing for better pick up when you're speaking to Alexa at a distance. What can Amazon Echo Spot do? In spite of its small size, Amazon Echo Spot lets you do just about everything the Amazon Echo Dot and Amazon Echo Show can do. You can listen to audio books, ask for updates on the news and weather, check your to-do lists, watch video clips, listen to music and ask general questions. To conduct a video call, you just need to call anyone with another Echo Spot, an Echo Show or the Alexa app. Echo Spot also lets you make audio calls in addition to those by video. Audio-only calls to the US, Canada and Mexico are free on the Spot. 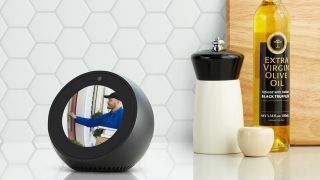 The Echo Spot can play video clips from Amazon Video and other sources, and pump out the jams from the likes of Amazon Music, Spotify and Pandora over Wi-Fi or Bluetooth. Or, you can insert a cable into its audio output port to connect to an external speaker. You can also control your smart home devices with the Echo Spot, such as turning lights on or off, locking doors, adjusting thermostats and shutting off sprinklers. Echo Spot will also display live feeds from cameras in your home, such as baby monitors and front door cameras. While it's not a smart camera on its own, Spot lets you see what the cameras are picking up. Just like the other members of the Echo family with Alexa support, Echo Spot has access to countless Alexa skills. These act as conduits through which you can connect with other services, such as Domino's Pizza and Uber. With Alexa skills, you can ask your Spot to perform tasks with simple voice commands. Finally, Echo Spot lets you customize the alarms and the actual clock portion with different faces, because the Apple Watch can't have all the fun.